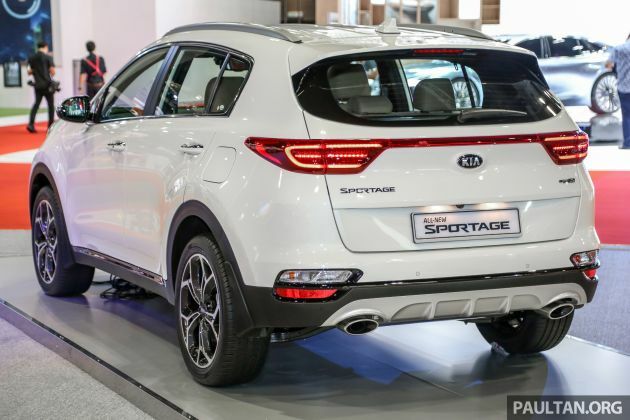 The facelifted Kia Sportage is currently on display at the Kuala Lumpur International Motor Show (KLIMS 2018) in 2.0D GT-Line guise, which is one of two available variants offered for the five-seat SUV, the other being the 2.0 EX. Both have already gone on sale here, with the 2.0 GT-Line retailing at RM149,888 on-the-road without insurance, and the 2.0 EX at RM126,888. 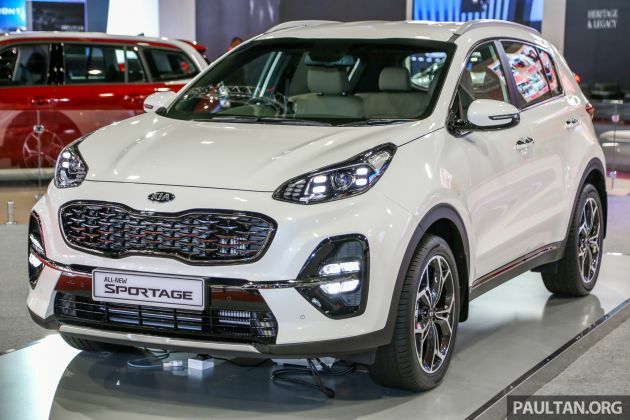 With the facelift, the Sportage front fascia gets a new bumper as well as LED headlamps with four-point LED daytime running lights within them like on the Cerato and Ceed. The lower apron has also been redesigned with new chrome trim pieces that run from the fog lamp enclosures towards the number plate holder. At the back, the reverse lights and rear reflectors are now stacked on top of one another within a reshaped bumper, accompanied by chrome exhaust finishers. The GT-Line gets LED-type rear combination taillights along with other extras over the EX, including a unique grille design, “ice cub” LED front fog lamps and 19-inch alloy wheels. On the inside, you’ll find a new steering wheel with the GT-Line’s being a flat-bottom type. Features include dual-zone climate control with rear vents, paddle shifters, alloy pedals, a powered tailgate, keyless entry and start, eight-way powered seats (driver side only in the EX) and a seven-inch touchscreen infotainment system. Others items that are specific to the GT-Line are a Qi wireless phone charger, 4.2-inch multi-info instrument display (3.5-inch in the EX), and dual-tone leather upholstery as compared to the fabric material on the EX. In the safety and driver assist department, the Sportage offers six airbags, Blind-Spot Collision Warning (BCW), Rear Cross-Traffic Collision Warning (RCCW), Parking Distance Warning-Forward (PDW-F) and Vehicle Stability Management (VSM). Under the bonnet, the Sportage GT-Line is powered by a 2.0 litre R CRDi four-pot with 185 PS at 4,000 rpm and 400 Nm of torque from 1,750-2,750 rpm. An eight-speed automatic is mated to the oil burner, replacing the six-speed unit from before. Those who want a petrol engine will have to opt for the EX, which sports a 2.0 litre Nu MPI four-cylinder that is paired with a six-speed automatic transmission. Output figures for the petrol mill remain the same, at 155 PS at 6,200 rpm and 192 Nm at 4,000 rpm. Agreed.Amazing Kia Sportage superb CKD build. Problem is the need to park far far away during family gathering. so low power output can have the moniker GT? Huh?? Looks better?? With that frog-face with jumbled up design elements? You gotta be kidding..
185ps 400nm 8 speed. Last time i check X1 20d has lesser power than this. And there is also M-sport badge on it. Same price range as CRV. Abit down on Hp kompared to Proton X70. Under 150k is a fair price considering it doesn’t have the comprehensive active safety suite that the competition has. 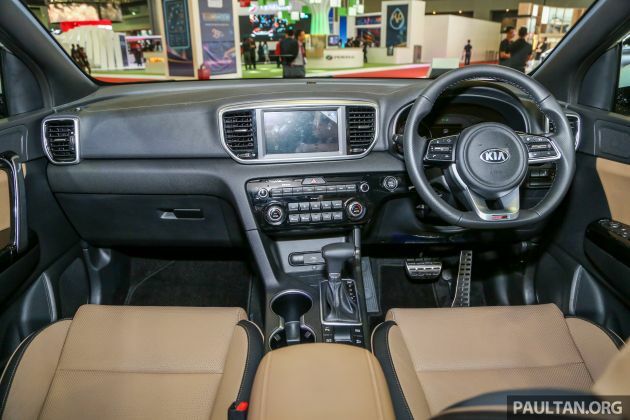 The Proton Persona and Iriz at KLIMS 2018 are nothing special right? Meaning to say normal. No hidden changes. Whats that got to do with this article? Sesat kes again? panaromic omission i can understand. i drive 2.0 Cerato now and the ventilated seat is really something we need here in Malaysia given our weather. kinda disapointed even on top spec there is no vent seat. however, this is a lot lot more better than the pre facelift spec. at least there is more driver aid and safety now compared to just airbag + ABS in the previously. it has 4wd which is omitted by many of its rivals. The nature of 4WD is good but how good it is when come to execution? Alot of brand has these 4WD/AWD but when the front Tyre slips, they cant send proper power to the rear except Subaru AWD. 400 Nm of torque bro. If talking about acceleration torque is king. Went to test drive the sportage diesel the other day. It was amazing and really value for money. Moreover they are giving out savings of 6k.